In 2011, the Cooks Company established a new affiliation with the Royal Fleet Auxiliary (RFA). 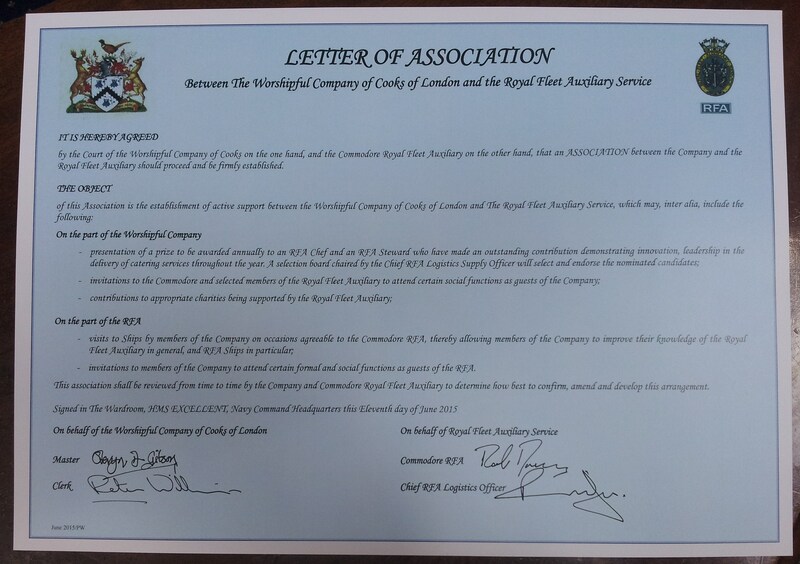 In 2015 we cemented that relationship with a joint ‘Letter of Association’ signed in Portsmouth by the then Master Dr Stevyn Gibson and the Commander RFA, Commodore Rob Dorey. The RFA is a civilian-manned fleet, owned by the MOD, which supports Royal Navy ships around the world, supplying warships with fuel, ammunition and supplies. The RFA fleet is fully integrated into the RN’s command and control system and forms a vital part of maritime operations. It is entirely appropriate that Cooks should be linked with them.